Kathy was leading a full life in Lexington, Kentucky. She was teaching English at a small private college, working in admissions at an equine hospital nearby and riding her horse whenever she could get the chance. Then one weekend she started to feel really sick. By that Monday she was in the hospital and diagnosed with leukemia. Soon she was transported to a major cancer hospital. A bone marrow transplant was her only chance for life. She needed a donor. Her family didn’t match so she turned to an international donor database and a 25-year-old woman in Europe was an exact match. She was overjoyed and received her bone marrow transplant. Soon after, she moved home to Cleveland. She was determined to regain her strength and ride horses again. She learned about Fieldstone Farm from a friend and read about the partnership with The Gathering Place and thought maybe there was a chance she could join a class. She started riding last year and has been getting stronger by the week. 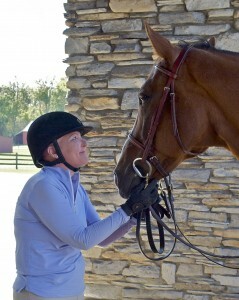 When she is at Fieldstone Farm she forgets all about her illness. She is in the moment, riding and working with horses, her love. She says riding settles her. It gives her peace, confidence and direction. She also has developed her core strength and balance. She loves working with the horses so much that she is now learning to carriage drive, and even volunteers to help other participants at the farm. Kathy always knew horses would be part of her life, but she never knew how they would change her life in such an important way.